So far in this blog, I haven't reviewed very many science books although they are a passion of mine (even more so since I started down my journey of critical thinking in my twenties). When I take a science book out of the library, I tend to just tip my toes in it, reading over the parts that interest me. So many books I've read in the past referenced this book as one of the canon in skepticism. 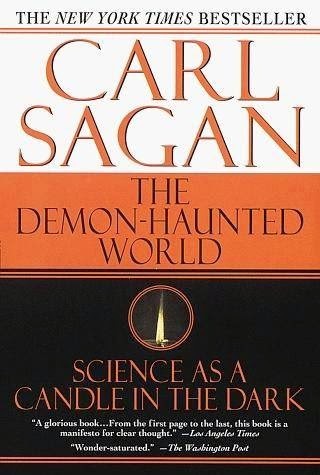 I think watching Neil deGrasse Tyson's wonderful Cosmos finally convinced me to read The Demon-Haunted World cover to cover. This book is more than just a debunking of pseudoscience, it is a critical plea for scientific thinking in all aspects of our lives. Sagan wrote this book just before he died in 1996 but he accurately foresaw the "dumbing down" of American culture and the move away from thoughtful analysis. A large chunk of the beginning of the book deals with Sagan's interest in extraterrestrials and why there is so far no credible reports of alien abductions. He got me thinking about it in a way I never have before, showing the similarities of "alien abductions" in the 20th century and witchcraft in the 17th century. Back then our culture was steeped in stories of witches, much the same way that ours is now saturated with movies and TV shows about aliens. How interesting, then, that there are few cases of witchcraft reported now (at least in the developed world) and how there were no alien reports before the birth of science fiction. The middle and latter part of the book are devoted to outlining the tools we need for our "baloney detection kits," and the need for a proper understanding of science in our culture. There are some extremely powerful passages here, including one on the importance of basic literacy, as seen through the story of Frederick Douglass, a black slave who taught himself to read and thus freed himself and many of his fellow slaves from ignorance and captivity. Even when some parts of this book depressed me (TV has only gotten worse since the 1990's in terms of ignorance and sensationalism), there is also hope, such as one community raising the money to build a children's science centre. Overall this book provides another important argument in favor of critical thinking being a necessary skill as members not just of democracy, but of the human race.